This summer, Sharktank Research Foundation and Planetary Biosciences released a product called TauriNAC. It contains NAC (N-Acetylcysteine), taurine, magnesium, green tea extract, vitamin C, and some other things. A study from Stanford University has shown that NAC helps lung function in CF patients. We designed TauriNAC with several objectives. We wanted TauriNAC to contain compounds that are very beneficial to people with CF. TauriNAC had to be easy to dissolve. It had to taste and smell good. Currently grape is the only flavor available, but we are experimenting with other flavors for the future. TauriNAC is packaged in small packets that can be conveniently transported. To take TauriNAC simply add the contents to some water and drink it. 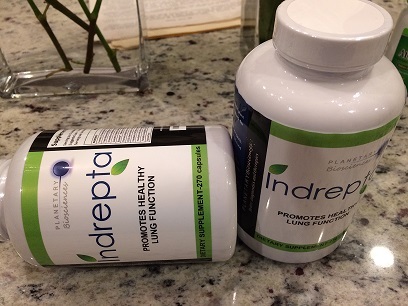 We made this product to accompany our previously released dietary supplement for lung health Indrepta. These are both part of our strategy to make high quality supplements for people with CF in order to maintain their health in an affordable and non-restrictive way. 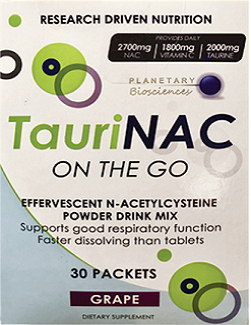 TauriNAC is currently available at the Planetary Biosciences website. Written by: jimcaldwell on September 13, 2017.